The US government works very hard… at making themselves look good. One of the ways they do this is to represent truly horrifying data in the best possible light. The number which seems to be manipulated more than any other number is the “official” unemployment rate — the headline rate which the government touts in the press..
One of the ways the government manipulates the official employment rate is by counting part-time workers as employed — even if they are working only one hour a week and are desperately seeking full-time jobs. To get a more accurate picture of the employment situation in America you need to look at the number of Americans who are employed but usually working part time. 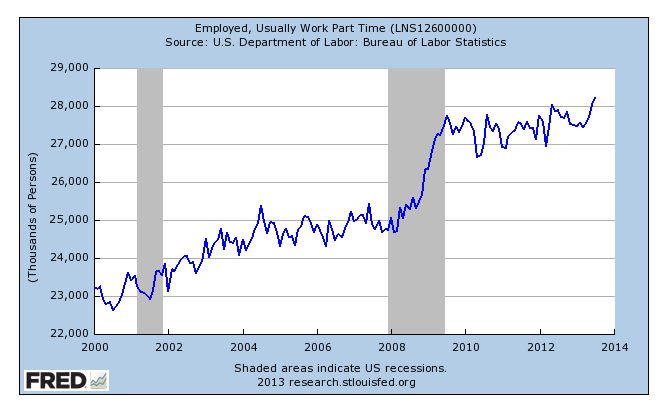 This chart is published by the St. Louis Fed, not by the Bureau of Labor Statistics (BLS). These numbers clearly show that the official end of the recession had no effect on our national part-time employment epidemic. Even worse, as ObamaCare begins to be implemented, employers are forced to convert even more full-time workers to part-time status. We are slowly becoming the French, who famously voted themselves a 35 hour work-week in 2000. Unfortunately, the French have run out of money and so have we. We as a nation cannot afford to maintain our 16.7 trillion dollar national debt by working part-time. In the long-term, the only thing that creates real and sustainable employment is economic growth. The barriers to economic growth in the United States are taxation and regulation. We should not expect to see improvement in the full-time employment numbers until the US government reduces the dual burdens of taxation and regulation on American business.